Left to right, National Action Network (NAN) Health Care Award recipient and Aetna Foundation President Garth Graham, MD; Senior Advisor to the President Valerie Jarrett; NAN President and Founder Rev. 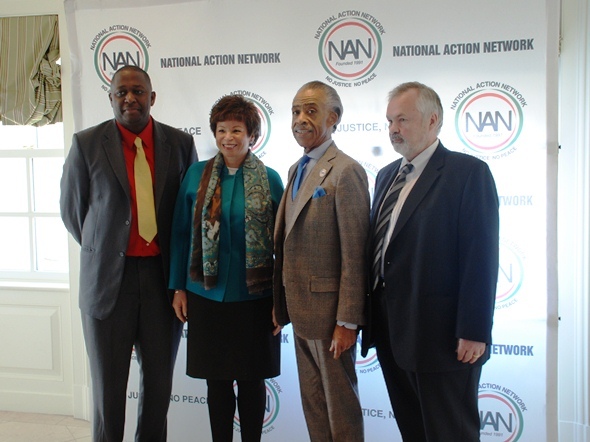 Al Sharpton; and award recipient and Kaiser Permanente Chairman George Halvorson attend the inaugural NAN Health Care luncheon in Washington, DC. Minority health care took center stage at a recent event hosted by the National Action Network (NAN) in Washington, DC. The inaugural NAN Health Care luncheon was created to continue a dialogue between community leaders, stakeholders, experts, and consumers to address serious and preventable health issues taking place in minority communities. Senior Advisor to the President Valerie Jarrett served as keynote speaker. Jarrett addressed some of the hiccups that took place in the early implementation of the Affordable Care Act (ACA) website, but stressed the importance of getting coverage for the uninsured. NAN recognized three health care industry leaders for their work in addressing health disparities in minority communities. Representatives of CVS Caremark, Kaiser Permanente and the Aetna Foundation each received awards.